Hiba has fled the horrors of Syria's war before. Now she faces being uprooted once again. Hiba, 24, left her home in the Eastern Ghouta region outside Damascus in March after an offensive by pro-government forces prompted rebels to agree to surrender and be evacuated to the northern province of Idlib. Hiba's family was among 50,000 people who joined them, fearing that her brothers would be conscripted by the Syrian army if they crossed into government-controlled territory. They decided to settle in Maarat al-Numan, a town about 30km (19 miles) south of Idlib city, where they hoped they would be safe. But now the Syrian government and its ally Russia are preparing for an all-out assault on the province, which is the last major stronghold of the rebel and jihadist groups that have been trying to overthrow President Bashar al-Assad. "I am very scared of the coming of the next days," Hiba says. "I can't think about anything else. I have bad memories from Eastern Ghouta. It is traumatising - to see the blood, the injuries. It was so bad for everyone." Hiba is haunted by her memories of the Eastern Ghouta, where more than 1,700 civilians were killed in only six weeks, and fears there will be a chemical weapons attack in Idlib. "The Syrian army doesn't listen to anyone - like in Eastern Ghouta," she says. After the destruction of their hometown, life in Idlib has been tough but stable. In the five months Hiba's family have lived in Maarat al-Numan, the biggest problem they have encountered is lack of work. None of them have been able to find jobs, and renting a house in the town costs between $100 (£77) and $200 a month. But unlike in the Eastern Ghouta, which was besieged by the government for five years, there has been a reliable supply of food, water and electricity. When Hiba first spoke to the BBC after arriving in Idlib, she explained how happy her family were to live outside, after spending months sheltering in their basement. The family even found moments for celebration. In April, she recalled how she had been forced to abandon her plan to get married and leave her wedding dress behind in the Eastern Ghouta. Now when asked about her fiancé, she laughs happily and says: "We are married. We got married in May." However, their lives are once more being disrupted by violence. As the bombardment of Idlib has intensified, Hiba says her little sister and brother - aged three and six - keep looking for shelter and asking: "Where is the basement?" "The buildings are too small for us to hide properly," Hiba says. "Idlib is an agricultural region. There is nowhere to take shelter and the planes are very loud." "The situation is getting worse, day-by-day. The warplanes target many areas here. We saw enough bombing in Eastern Ghouta. I cried so much when we heard the warplanes again." 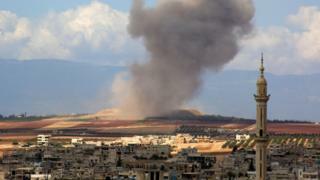 Idlib and its surrounding area was designated a "de-escalation" zone in 2017 by Russia, Iran, another ally of the government, and Turkey, which backs the rebels. But the government has declared that its priority is now to "liberate" the region "whether through reconciliation, which we prefer, or through military action". 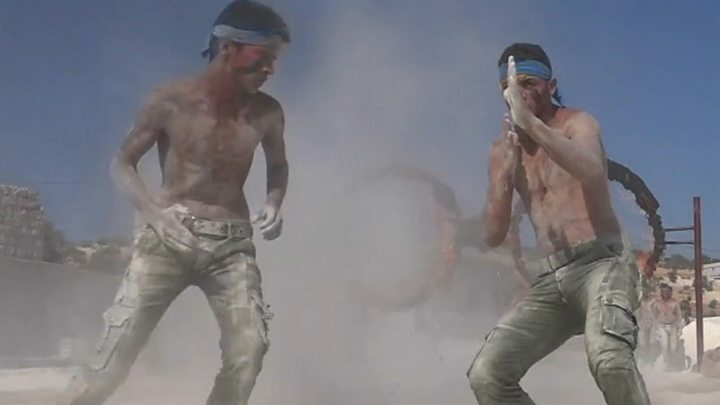 It has warned that it is determined to defeat the al-Qaeda-linked jihadist alliance Hayat Tahrir al-Sham (HTS), which dominates Idlib, "no matter the sacrifices". Media captionThe war in Syria could be about to enter its final stage. The war in Syria began when Hiba was aged 17. Her youngest siblings were born during the conflict and have never known anything else. Her 16-year-old brother Muhammad meanwhile became well-known after posting videos online showing what life was like under siege in the Eastern Ghouta. "All the young people here just want a chance to live in peace," Hiba says. She now avoids leaving the house for fear of being bombed. "I stay at home and try to learn Turkish and English. I also try to teach my little brothers. They need to go to school, but here they are very scared and they don't want to leave the house." Before the war, Hiba worked in a medical laboratory and taught English. Hiba says that while she has not witnessed any signs of preparations for a battle, she is fearful of what their future holds. Hiba knows their options are limited and feels they are running out of time to escape. "My mum and I are very scared for my little brothers and sisters." The family would like to travel to neighbouring Turkey to seek refuge, but the border is closed, smugglers charge at least $1,500 (£1,150) per person, and the route is dangerous. "It costs so much money. We left our house and all our belongings in Ghouta. We have nothing here." "I want to see the sea, the sky and the birds. But instead I am trapped here."